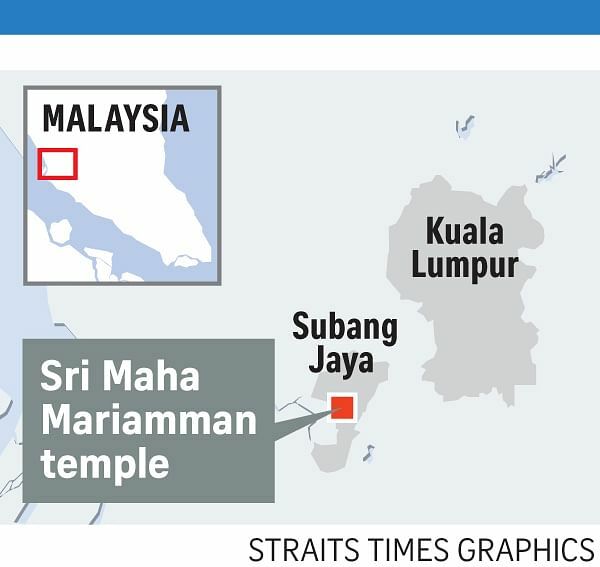 PETALING JAYA (THE STAR/ASIA NEWS NETWORK, BERNAMA) - Four more men have been arrested in connection with the fracas on Monday (Nov 26) at the Seafield Sri Maha Mariamman Temple in Subang Jaya, said Selangor police chief Mazlan Mansor. Datuk Mazlan said the latest round of arrests bring the total number of those detained to 21. “We are monitoring the situation minute by minute to ensure that it does not worsen,” he told a special press conference at the Selangor police headquarters on Tuesday (Nov 27). He said five more vehicles near the temple and at One City Mall were burnt on Monday night while a Fire and Rescue Department vehicle was also damaged by a group of people. The offices of property developer One City Development are located in the mall. It has been alleged that the temple disturbance was caused by plans to move the temple to another location 3km away, to make way for development. “Several groups also went to One City Mall, located some 1km from the temple, and broke the building’s glass panels and caused other property damage." “A fireman was also injured as he was putting out a fire near the temple,” he said. The fireman was critically injured after being attacked by protesters on Tuesday morning. A team of firemen had been trying to extinguish a burning car, which had been torched by angry protesters. The victim was dragged out of his Emergency Response System (EMRS) van shortly after arriving at the scene and was beaten up by a mob. Commissioner Mazlan issued a stern warning to those responsible to not make matters worse. “We will identify and track down those who created trouble at the temple and mall." “Stop issuing statements that will jeopardise public order. Instead, people should calm the situation,” he said. Mr Mazlan also said the police have leads that point to the mastermind behind all the trouble. “Let us investigate first and track him down." “We will also call up the housing developer to assist investigations,” he said. So far, more than 700 police personnel, including some from the Federal Reserve Unit (FRU) and other divisions have been deployed to the scene to maintain order, he added. Asked about the possibility that more people will gather near the temple on Wednesday night, Mr Mazlan said the police would take the necessary action to maintain public order and safety. “The situation is still under control. We advise everyone to refrain from speculating on the matter and let the authorities perform their duties,” he said. Earlier Mr Mazlan had stressed that the riot has nothing to do with any racial issues. "Those who are spreading that it is a racial issue online must stop immediately,” he told a press conference in Semenyih. The police denied that they were slow in handling the incident. Inspector-General of Police Mohamad Fuzi Harun said: "The police were informed of the incident at 2.40am and a team was already at the scene at 2.50am. The district police chief arrived there 30 minutes later." "We have the sequence of events in our diary." "If we had not acted quickly, there could have been a possibility of a death during the riots," he said during a press conference on the matter at the Selangor police headquarters on Monday night. Backup was called by the ground team, and 700 more policemen arrived to help control the situation. "I hope these irresponsible parties stop creating speculation. They do not know the real situation." The IGP said that the police would investigate all aspects of the case, including allegations that a developer had sent a group of people to force the people at the temple out. However, he noted that it was too early to tell if it had any involvement at this point of time. The Deputy Inspector-General of Police Noor Rashid Ibrahim had been reported earlier as saying that the temple incident was not a racial clash but a land dispute. "During the siege, the police arrived at the scene. The intruders attempted to flee and a clash erupted between the two groups. As a result, three men were injured while several vehicles were reportedly torched," said Tan Sri Noor Rashid. "Perhaps the side wanting to take over (the land) engaged a group of Malay men to facilitate the acquisition." "It is possible that they are gangsters and, of course, the Indian group attempted to check the intrusion." "I have to clarify because it is a sensitive issue and I do not want anyone to take advantage (of the situation)."